A "black box" recorder from Lion Air flight JT 610 has been found by divers off the coast of Indonesia. There is as yet no indication of what caused the crash but the aircraft is believed to have experienced technical problems on its previous flight. Initial reports said the plane's flight data recorder had been found but a transport safety official quoted by Reuters news agency said later it was unclear whether the damaged device was the flight data unit or the cockpit voice recorder. "Tonight we will move as quickly as possible to download what is in this black box," Haryo Satmiko, deputy chief of Indonesia's transportation safety committee, told journalists. It could take up to six months to analyse data from the black boxes, officials from Indonesia's transportation safety committee have said. Mr Satmiko pointed to the device's poor condition as evidence of the "extraordinary impact" of the crash. 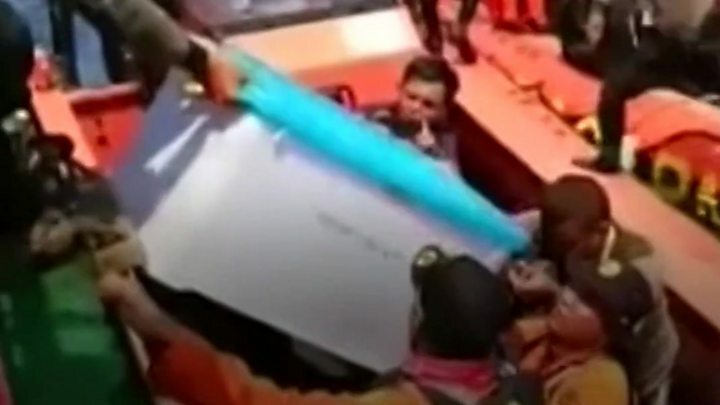 A diver identified as Hendra said the box had been buried in debris on the floor of the Java Sea. Another official, Muhammad Syaugi, said part of the plane's landing gear had been found, AFP news agency reports. "We have found bigger parts of the plane than we have seen in previous days," he added. What do we already know about the crashed plane? A log obtained by the BBC shows the plane experienced technical problems while flying from Bali to Jakarta the previous day. The log shows one instrument was giving "unreliable" airspeed readings and the captain had to hand over to the first officer. Altitude readings also differed on the captain's and first officer's instruments. Lion Air, a budget airline based in Indonesia, has acknowledged a technical problem occurred on the penultimate flight but said it was resolved "according to procedure". The company has sacked its technical director, Muhammad Asif. Representatives from Boeing are also meeting Indonesian officials as part of the investigation. Meanwhile, search officials are continuing the grim task of gathering body parts found at the crash site and taking them to land for identification. On Wednesday night, the funeral was held of the first identified victim, a 24-year-old woman who worked in the engineering ministry.